For the frosting: Mix the sugar, cream and vanilla until soft. Set aside. For the rolls: Preheat oven to 350 °F. Melt 3 tablespoons of butter at the bottom of a round mold. Add 1/2 of the brown sugar to the butter and stir well. Unroll the dough to create one large layer and seal the perforations with your fingers. Cover the surface in melted butter. Mix the rest of the sugar and cinnamon in a bowl and sprinkle over the buttered dough. Roll the dough tightly to create one big roll and cut it into 8 pieces. Place the rolls in the mold with the melted butter and sugar. Bake for 18 minutes. 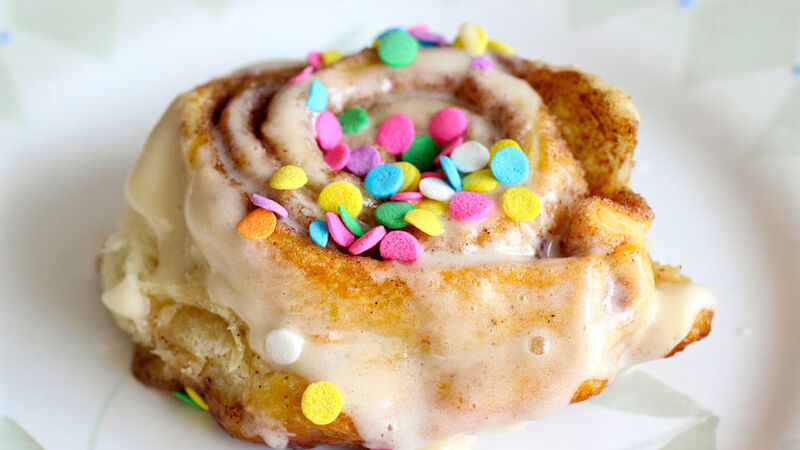 Add the frosting, decorate with jelly beans and serve. Serve right out of the oven for a better taste! This is an easy and simple cinnamon roll recipe to help you celebrate Easter in less than 30 minutes! Prepare these rolls with Pillsbury™ Crescents to make the preparation quick and easy!